The Portwest Chemtherm PVC Grip Gloves AP90 are unique as they offer exceptional chemical protection and thermal warmth, making them ideal for use in cold conditions. 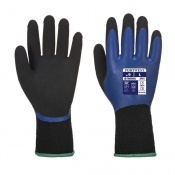 Their rough palm finish enables superior grip in wet and slippery conditions, while their tough PVC liner provides excellent mechanical protection. 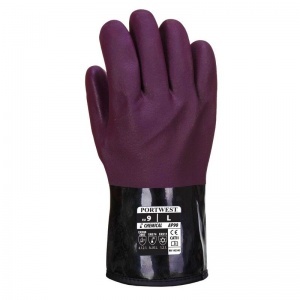 The Portwest Chemtherm Gloves are ideal for use in cold and wet conditions because of their thermal fleece liner, while their PVC sandy coat ensures exceptional mechanical protection. 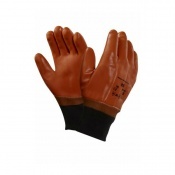 Furthermore, their high chemical resistance levels means that they offer excellent grip in all conditions, making them a highly versatile chemical-resistant pair of gloves. 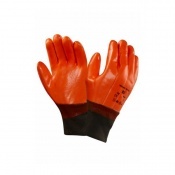 The Portwest PVC Gloves are available in four sizes that should be suitable for most users. To find your perfect pair, please measure the circumference and length of your palm and match the results to the table below.